I was just wondering, can I put on my SLK 230 (1998) wheels from C-Class (7Jх16, Н2 ET 43) ? Thank you in advance! Hi, I want to know if I can put 2006 SLK wheels on my 1998 SLK230. The only thing that doesn't match is the front wheel offset. The 1998 offset is 30 mm, and the 2006 wheel offset is 36 mm. Is that big enough to make a difference? 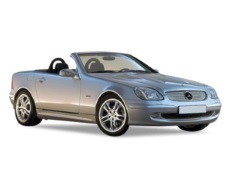 I have a 2000 MB SLK 230. Can I mount a 225/45R17 tire to a 8.5jx17H ET30 Rim? Hi,Richard,The stock rims size for your car is 16*8.0 offset is 30mm,So,8.5jx17H ET30 Rim is ok.And the stock tire size is 205/50R16,your 225/45R17 is out of compatible torlance. I have the performance package, so my car came with the 17" rims (vs the 16" rims mentioned above) - my front rims are 7.5" wide and my back rims are 8.5". I have an extra set of 225/45R17 tires and I wanted to see if I could mount them on the back rims (8.5" wide) - as I understand your response, the answer is yes. If so, I'll be able to have 225/45R17 tires on both the front and back. Could rims with bolt holes for M14x1.5 bolts be safely used on car with M12x1.5 bolts? Example - 2002 CL 18" rims on 2001 CLK. Hi,Slavek,No,the inner diameter for M14*1.5 is 14mm bigger than M12*1.5. Hi,Jeff,Both tires from SLK can fit for you car,But the wheel offset from SLK is smaller.It will not poke out,On the contrary,It will carved in.You can buy some spacers to modify it if you like that wheels. 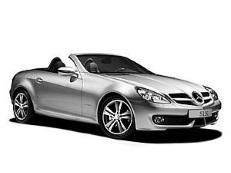 Hi, just wanna ask... does it fit if I used sport rim SLK 2012 to my w211 model 2007? 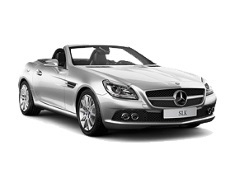 Hi,Shukri Ahmad,Can you explain the SLK 2012 car rims size and w211 model()? Hi. Trying to replace wheels on my 2008 slk280 and the front wheels won't clear the grease caps. I have the 225/45/17 on the front and 245/45/17 on the rear Tire guy wants to remove them. Is that okay? If not, what wheels do I need so this won't be a problem? I have 2000 SLK with 17" AMG wheels, can I put them on a 2002 CLK 320 Cabrio? Hi, Don Rudd,yes,it can fit for. Hi,Frank,Thanks for your info.Will update it assp. Hello, to see the rear wheel pair 255/35R18 you should press + near the front wheel pair 235/40R18. Hi looking to fit newer wheels from 2014 C class size 7.5Jx18 ET47 front and 8.5Jx18 ET54 rear on 2009 SLK 350. Will there be any issues? Hi, I have a 2015 S205 with 19" run flats. Would a 2012 SLK spacesaver spare wheel 17" fit? If not which type would be suitable. Hi,Craig,Yes,if it can fit for. Hi, I have a 2012 SLK R172 with 18" AMG wheel. If I increase rear sidewall ratio from 245/35/18 to 245/40/18, will it rub? Hi,Prote,No,245/40/18 is not compatible with your current tires.You'd better not fit it. I don't understand if the tire calculator is saying GO FOR IT or NO WAY. Hi,Daemon,245/35/18 is not compatible with 255/35/18.And the wheel offset different is too big.Do not suggest that you try it. Hi John, thanks. I think I can understand the wheel calculator better today. I thought it was two tires at first! Ha! Now I see a little better. It looks like the suspension parts are brought in closer to the rim, as if the wheel pulls them out farther from the car. Is that the problem with the offset? Hi,Daemon,Offset is a num to measure the distance from middle of wheel width to wheel center hole. Friend gave me 18"rims with 225x40 tires can I get them to fit 1998 slk230 with spacers??? Hi, I've got an R172 SLK200(2014) with no space saver. I'm having trouble finding a collapsible space saver wheel for my car, so wondered if a collapsible space saver from a 2005/R171 SLK would do the job ? Many Thanks, Tony.